Police officers were called to a violent disturbance at a house in Colne late at night, which resulted in one man being stabbed and another suffering head injuries. Neighbours reported seeing several officers and “blood on the street” following an altercation in Dickson Street. Police confirmed that two men were arrested shortly afterwards. A police spokesman said: “We were called at around 11-40pm on Tuesday, March 14th to reports of a disturbance at an address on Dickson Street, Colne. “Two men are thought to have forced their way into a property armed with weapons. “The occupant, a 61 year old man, suffered injuries to his head and hand. “During the incident one of the men who entered the address suffered a stab wound to his shoulder and torso before the pair fled the scene. “The 35-year-old man was later taken to Airedale Hospital, Skipton, where he is still undergoing treatment. 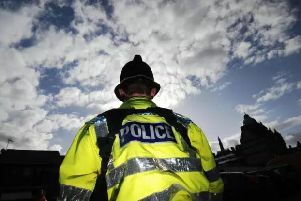 “A 30-year-old man from Burnley was later arrested on suspicion of aggravated burglary while a 61-year-old man from Colne was arrested on suspicion of Section 18 wounding.